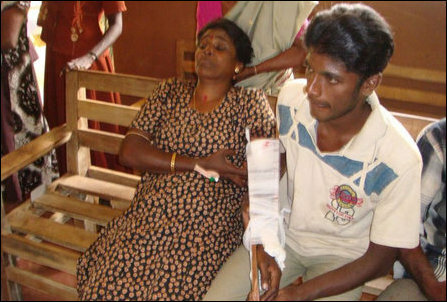 Five civilians, including a10-year-old girl and a 56-year-old Saiva priest, were killed and 83 civilians wounded Friday when Sri Lanka Army (SLA) fired artillery shells targeted 'safe zone' areas such as Iruddumadu in Udaiyaarkaddu and Va'l'lipunam in Mullaiththeevu district at least four times, according to medical sources in the region. More than 20 of the wounded people were children. More than 20 of the wounded victims are children. The shelling and Multi-Barrel Rocket Launcher (MBRL) rocket fire targeted the villages Thearaavil, Mayilvaakanapuram, Iruddumadu, Va'l'lipunam and Theavipuram at 10:45 a.m., 11:00 a.m., around 2:30 p.m., and 6:00 p.m.
A 10-year-old girl was killed Thursday night around 11:00 p.m. at Moongkilaa'ru where Ki'linochchi district Government Agent's office is situated. A Saiva priest, identified as Sivam kurukkal, was killed at Mayilvaakanapuram at 6:00 a.m. Friday. Two dead bodies of civilians, killed in Va'l'lipunam and Theavipuram, were taken to Putukkudiyiruppu (PTK) hospital mortuary. One of the slain victims was identified as Thuraisingam Paranthaman. An elderly man was killed and 34 civilians were wounded in the shelling at Iruddumadu around 10:45 a.m.
SLA launched artillery fire Friday around 6:00 a.m on the IDP settlement in Mayilvaakanapuram killing a Saiva priest, Sivam Kurukkal, 56 and seriously injuring four including the priest’s son, Kukaran, 17. The three others injured are Lembert, 46, R. Ravichandran, 46 and Mariyamma, 36. 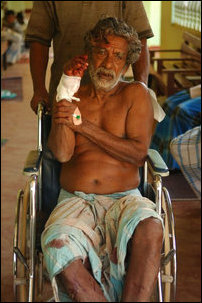 The injured are admitted to Mallaavi hospital displaced to Moongkilaa’ru due to SLA shelling. Village Officer P. Sabaratnam, 48, Ketheeswaran, 51, A. Prasath, 14, K. Thevi, 50, Isayarasi, 11 Isaivaa’ni, 10 and Isaiyarasan, 7, were seriously injured in the above shelling. SLA shelled the IDPs in the ‘safety zone’ declared by the government Friday at 10:45 a.m and again at 11:00 a.m killing an elderly person and seriously injuring 34 IDPs. The seriously injured IDPs are Pushpavathy, 65, Perumal Kurukkal, 71, K. Kowsitha, 20, K. Balabaskaran, 42, Kangampikai, 30, Vijay, 12, Visihithira, 10, Vithusan, 04, T. Piriyarasa, 30, S. Vikinarasa, 52, V. Senamitha, 17, Kowthami, 17, Kamalampikai, 45, Yarlnilavan, 09, Laxsumy, 60, Neyanathan, 24, Kiri, 35, Vadivalakan, 21, Mathivanan, 28, Thayalini, 19, Pushpathevi, 65, Yogalingam, 42, Uthamani, 50, Yarlinpan, 19, Kiritharan, 26, Yarlanpan, 26, Latheepan, 20, Sathiyasoroopan, 29, Eelavan, 19, Kiruban, 12, Mathiyalakan, 22, Thambirasa, 30, Piratheepan, 23 and Alexan, 13. Two IDPs were killed Friday in the SLA artillery fire on the IDP settlements in Va’lipunam and Theavipuram areas. One of the two killed was identified as Thuraisingam Paranthaman and the other is not identified. The IDPs injured in the above shelling are Veerabahu Kanapathipillai, 72, Nakuleswaran Jeyakumari, 40, Baskaran Shanthakumari, 40, Veeratheeran Thanusalini, 03, Asaipillai Deluxi, 11, R. Pirabathevi, 50, V. Pirasath, 16, Nirusan, 12, Arunthathi, 42, Anusa, 03, Jeyakumari, 40, Thanabalan, 32, P. Shanthakumari, 37, T. Sobana, 28, T. Thamilventhan, 24, K. Jeyakumari, 30, P. Rathi, 42, Jenifet, 32, S. Selvaroopan, 28, K. Jegatheeswaran, 42, Nadarasa Narenthiran, 22, Jeganathan Sarswathy, 47, Paramalingam Losini, 40, Kanagalingam Mathusa, 14, Nallathamby Parameswaran, 30, A. Sasikumar, 30, Nitharsan, 19, K. Visuvalingam, 52, Nagalingam Nadarasa, 56, Nadarasa Nagendran, 22, Nallamma, 71, Ulageswari, 50 and P. Kularany, 50. 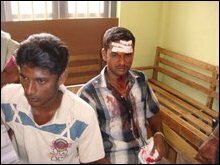 The two IDPs injured in the SLA shelling Friday around 6:00 p.m in Udayaarkaddu are Panugopan, 21 and Rajeev Thamilini, 23.